Do you ever struggle to get started on a simple task? I do all the time! So if your answer is “yes” to this question, it must mean you’re human! Recently I was working with a high school student who was struggling to get started with a homework assignment. I discovered that he simply needed to use his imagination better in order to take action. Check out the video to see what I mean. I asked him to imagine himself doing the assignment. I told him he didn’t have to start it right now, but I wanted him to imagine it, and if couldn’t imagine it, look up and make sure he understood the task. So he looked it up, and then imagined what he needed to do to get it going; whether it was creating an outline or starting to do some research or just making a step by step plan. And I don’t just use this with my clients. I use it all the time. In fact, just before this video, I was laying on my couch, and I was having a really hard time motivating myself. 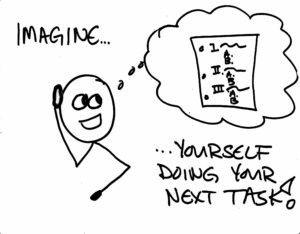 So I imagined the next task I had to do, and I imagined myself doing it and figured out what the steps were I needed to take. And it worked, I was able to get myself organized in my mind and motivated enough to get up and get going. If you want more tips like this one, please feel free to check out my online course. I have a variety of tips for procrastination there.